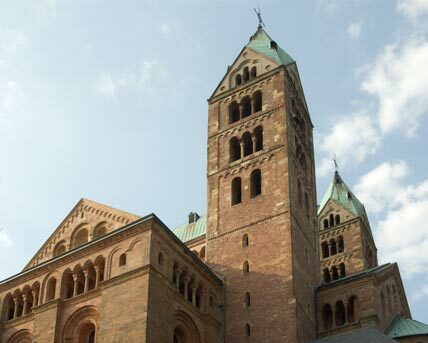 Speyer is the site of the largest Romanesque church in the world, Speyer Cathedral – a strange situation for a town that was a seemingly unimportant village with only 500 inhabitants when the construction of the cathedral began. 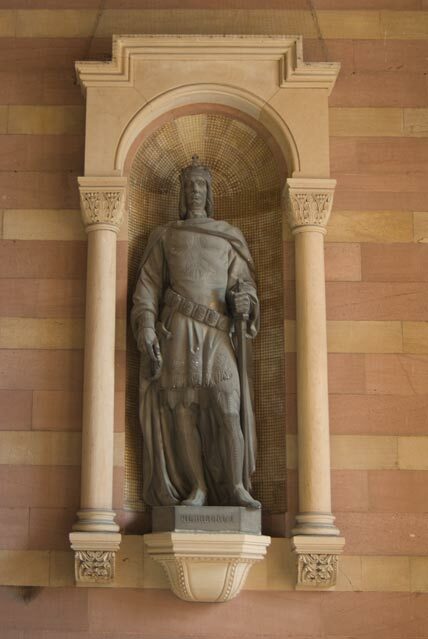 Kaiser Konrad II was the first Salian monarch on the throne of the German King and the Holy Roman Emperor. 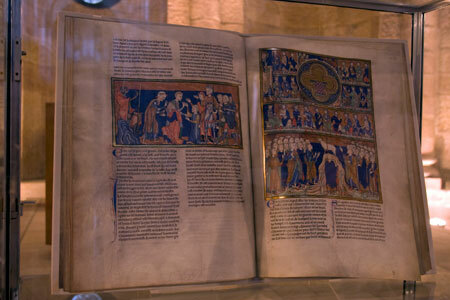 As there was resistance to his election as king and emperor he − like many an emperor before and after him − relied on the clergy and the free imperial cities to extend his sphere of influence. The German Empire was not a national state like France but more a loose alliance of German and Italian princes. 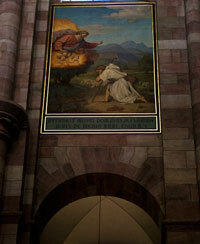 Hence the building the largest church north of the Alps was intended to contribute to his power. 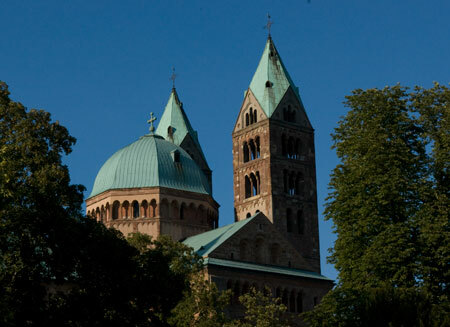 Why he chose Speyer of all places remains a mystery although it's true that Speyer was already a bishopric in the 4th century and was thus much more than just an mere village. 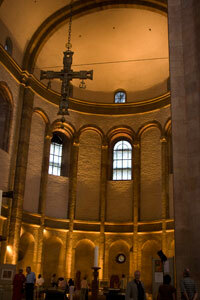 Around 1030 the Emperor himself laid the foundation stone for this impressive ecclesiastical structure. However neither he nor his son was to see its completion. 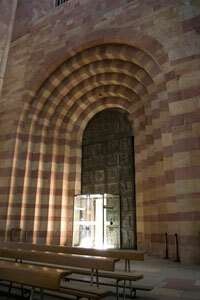 The cathedral was not consecrated until 1061. 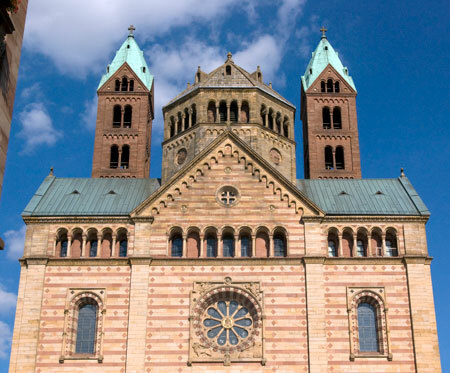 During construction, Emperor Heinrich IV had half of the cathedral pulled down again and rebuilt even bigger than before. 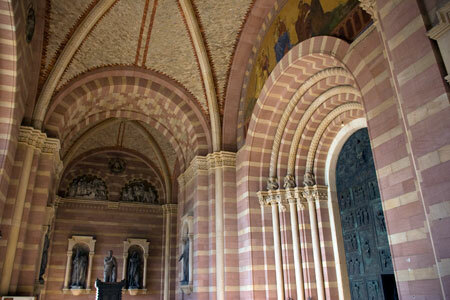 The flat wooden ceiling that had been originally planned and already built was taken down again and replaced by an arched ceiling, easily the largest of its time. To do this, many static and construction problems had to be solved as the knowledge from the Roman era had been long lost. 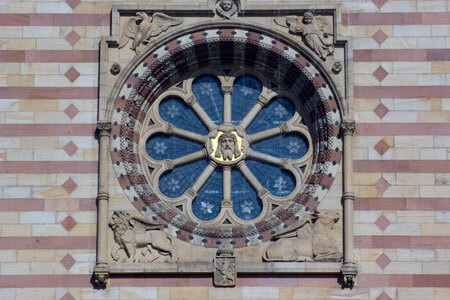 As a result the cathedral truly did turn into an imperial cathedral, and became the place of rest of many emperors. 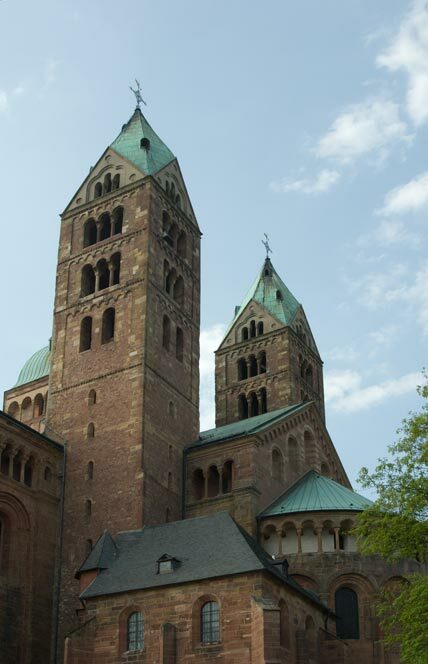 The cathedral remained intact up to the War of the Palatinate Succession while the small village of Speyer gradually grew and developed. 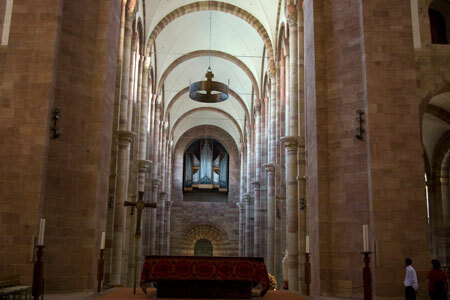 On the approach of the French troops, Speyer's citizens tried to save their possessions by hiding them in the cathedral but the French troops broke into the cathedral and set the huge piles of household possessions on fire. 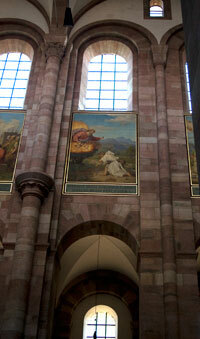 The enormous heat caused the west part of the arched ceiling to collapse. 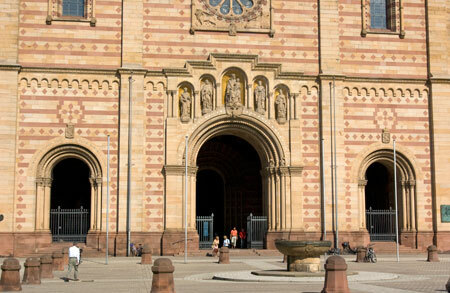 It was not until the second half of the 18th century that the reconstruction of Speyer Cathedral was once more commenced. The turmoil of the French Revolution also spread to Speyer which had become a French possession through the Treaty of Lunevillè. 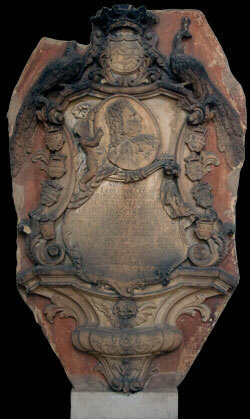 In 1806 rioting citizens destroyed the altars. 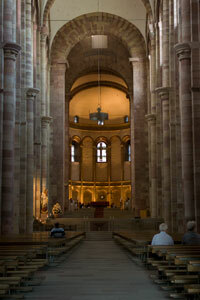 The Cathedral was to be torn down and its stones used for building. 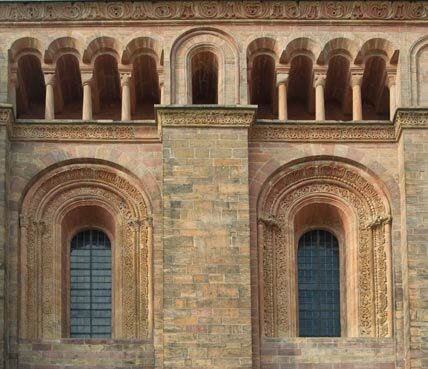 The bishop of Mainz, which was similarly a French possession, just managed to stop this but Napoleon's troops used the cathedral as a straw store and cattle shed nevertheless. After the end of the Napoleonic Wars the entire left bank of the Rhine in the Palatinate area was taken over by Bavaria. 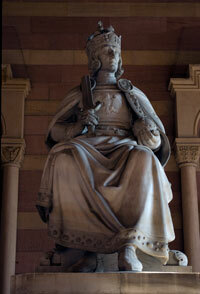 The Bavarian King had the Cathedral renovated and reconsecrated. 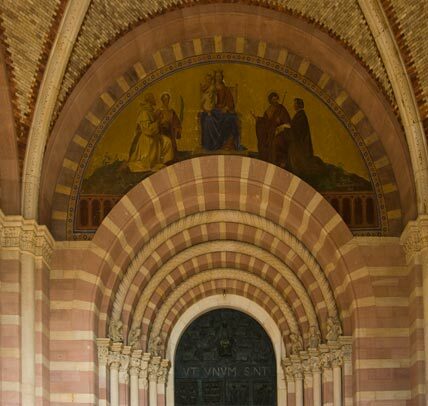 It was thanks to him that there is a major stylistic inconsistency in the cathedral: the interior was decorated with enormous pictures in the Nazarene style which do not do justice to the character of this splendid Romanesque church. Renovation work on the cathedral has been ongoing since 1996. Hopefully the merits of this amazing structure and its original appearance will be retained. 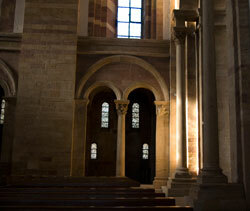 In August 2007 there was an exhibition in the choir of Speyer Cathedral which offered a unique opportunity to visit this area.